Creating a novel in a month should be a month, but I found that I am getting more with the NaNoWriMo challenge than just words in my computer. 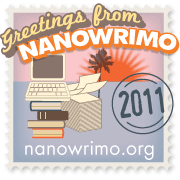 Pushing myself beyond my ordinary and expected, making new connections (and strengthening others), and even learning new ways to balance it all are just some of the additional benefits that I have received through NaNoWriMo. – Free stuff. The NaNoWriMo official website provides links to a number of great giveaways for those that sign up for the challenge and also some great gifts for the winners. Several sites are also joining the giveaway bandwagon and providing access to writing tools for free during the Novel Writing Month of November. – Accountability. My word count for the day and for the full challenge is posted on the website for everyone to see. Add to that my writer friends who greet me with, “Hello, what is your count for the day.” Saying zero is embarrassing so I try to get in a few words throughout the day so that my word count will continue to rise. Doing more work on my NaNo project provides me with the motivation, momentum and mental attitude to get other writing done as well. – Another plank in the platform. Building a writing career takes the action of building a platform where my words can be presented and sold – either to clients for their projects or in the form of my own products. Getting involved in forums, chats and local write-ins all provide more material for my ever-expanding platform. Fiction writing can be the only path or it can be an additional leg in a freelance writing career. Joining the NaNoWriMo challenge provides opportunities to build writing experience, grab up some great writing tools and make writing connections that will push me to the place I want to be. Words may be the ultimate result, but I find I am getting more with the NaNoWriMo challenge that I would have ever imagined. Thanks for the link – It is very important that we push ourselves beyond where we are and #NaNoWriMo can be a great tool for that action!